Battery powered digital gauge with an accuracy of 0.1% full scale in pressure ranges from -1 to 3 bar up to 1000 bar. The LEO 1 digital pressure gauge features 6 pressure units, rotatable display, zero tare & peak hold display functions and optional ATEX approval for intrinsic safety. LEO 1 digital pressure gauge can be permanently mounted as an alternative to an analogue dial pressure gauge or used as a convenient portable digital pressure test gauge. The LEO1 digital pressure gauge features a low powered LCD display to conserve battery life, a maximum or minimum value which can be displayed simultaneously with the live pressure reading and an auto timeout which can be deactivated if necessary for continuous reading. For hazardous zones the LEO-1-Ei digital pressure gauge is ATEX approved for intrinsic safety. Site measurements for field operators in the water utility industry. Monitoring hydraulic pressure on test rig used for load testing. What is the burst pressure for the 300 & 700 bar units? Around 1,100bar at ambient temperature. The standard LEO1 300bar and 700bar are both built the same way mechanically. The 300bar silicon chip sensor will get damaged somewhere above 400bar overpressure limit, and the 700bar range silicon chip sensor is limited to 700 bar overpressure limit. We need a pressure gauge to measure over 0-10 kg/cm² and 0-50 kg/cm², which LEO1 would we use? The -1 to 10 bar and 0 to 100 bar range LEO1 would be the closest standard ranges, and you can select to read in kg/cm² units from the on screen menu. What is the difference between the -1 to 30 bar vented gauge and the -1 to 30 bar sg range? G, VG or Rel (Relative/Vented Gauge Reference) means that the reference side is open to the atmosphere, so the zero reading will not change when atmospheric pressure changes. 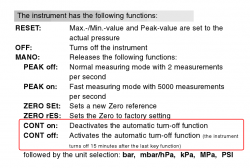 You still have to trim the zero occasionally but this is due to instrument and temperature changes over time and is much smaller than what you would see for a sealed gauge reference unit below. SG (Sealed Gauge Reference) means that the reference is fixed, in most cases zero is set to 1 bar absolute, so zero will drift around a little with changes in atmospheric pressure, but you can trim out the offset as often as you like between tests. I have a -1 to 30 bar range but the gauge is reading about 1 bar when open to atmosphere when it should be reading zero, is there something wrong with the instrument or am I using it wrong? The -1 to 30 bar sg range is actually a 31 bar absolute range, so you can use it as an absolute range (0 factory set at perfect vacuum) or a sealed gauge range by setting current absolute pressure reading to 0 with port open to atmosphere. 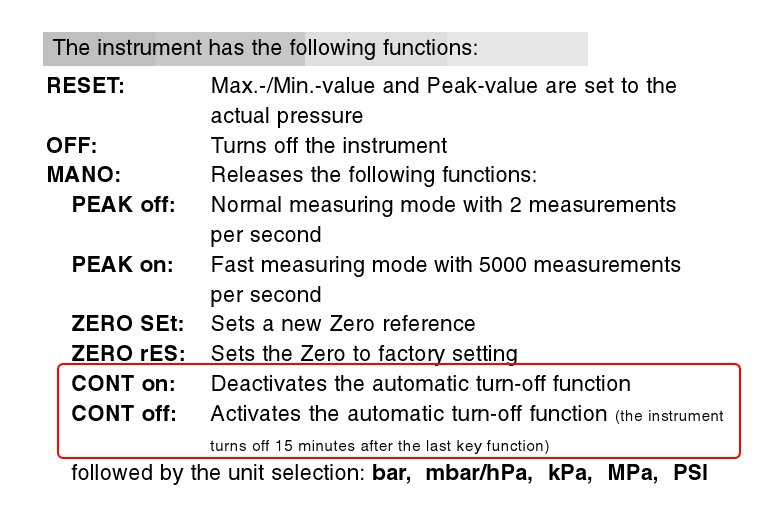 You can set a new zero referenc as often as you like by accessing the ‘MANO’ mode and scrolling through the option until you get to ‘ZERO SEt’ and then make sure the gauge port is open to atmosphere, before you press the right hand keypad ‘ENTER’ button to zero the displayed reading. What is the accuracy of the LEO1 gauge? The accuracy of this pressure gauge is +/-0.1% full scale at room temperature or +/-0.2% full scale including temperature errors between 0 and 50 degC. Both errors include linearity, repeatability and hysteresis errors. Will a -1 to 3 bar range LEO1 pressure gauge be suitable for measuring -35 mbar? The reading resolution for this range is 1 mbar, so it is feasible to measure the pressure, however the accuracy of 0.2% full scale over the 4 bar span will produce an uncertainty of +/- 8 mbar at 35 mbar (~23%). So despite the gauge having a reasonable enough reading resolution, we would not recommend it for measuring 35 mbar, due to the reduced accuracy at this pressure. Is the LEO1 suitable for measuring from atmospheric to -1 bar whilst still retaining the 1 mbar resolution at the -1 bar vacuum level? Yes the display resolution will be maintained, but bear in mind that the accuracy of reading is +/-0.2% FS which for the -1 to 3 bar range will be +/- 8 mbar despite the digit resolution. What sampling rate does the pressure gauge use? 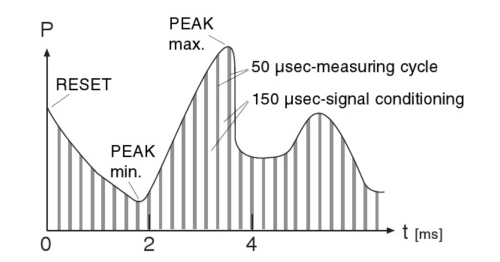 For the “Peak Mode”, the memory is updated 5000 time per second, this is broken down into 50 microsecs for measuring rate and 150 microsecs for signal conditioning. The actual update of readings on the display will be 1-2 times per second. We are looking for a peak-hold function with a high sampling rate of 1000 samples/sec or more. Do you know if the LEO1 can do this? The LEO1 has two peak hold modes, the “Peak” mode has the fastest sampling rate at 5000/sec. We are looking at using the LEO1 pressure gauge to monitor testing of pressure vessels and we need to display an internal pressure reading at the point of failure during a burst test. We will need the pressure gauge to sample quickly, but the display rate of 2 updates per second is too slow, is there an alternative that is faster? The LEO1 will store the maximum pressure reached during a test so that it can be recalled at any time by selecting the max reading display via the display menu. There is two modes for holding the peak value, MANO and PEAK. If the PEAK mode is on, then the stored maximum pressure reading will be updated at a rate of 5000 times per second. So although the live displayed reading updates twice per second, the memory can be updated at a much faster rate. Is the LEO 1 digital manometer capable of recording peak pressure? The LEO1 has a peak hold function which checks at a rate of 5000 times a second to see whether the previous highest reading has been exceeded. Would the LEO1 be able to record the highest pressure measured on a piece of equipment? We are having issues with random pressure spikes and would like to record the event, since we cannot be there to watch a gauge all the time. Yes the LEO1 can do this using the high frequency peak hold memory function. If the LEO1 is run in peak mode it will update the max/min record 5000 times per second. I am looking for a digital pressure gauge to measure the peak value of short air pressure bursts. We are testing our product resistance to pressure. Therefore we are bursting one part once in a while with compressed air up to 16bar. The part would normally burst within a few seconds at a pressure somewhere between 5 to 10 bar. The digital pressure gauge we require will be used to record the max pressure at the burst point. What pressure gauge would you suggest? 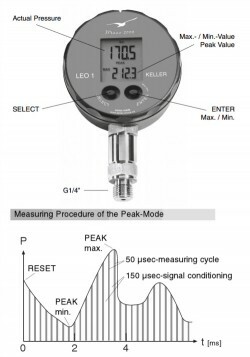 The LEO1 is a pressure gauge with a high sampling rate peak memory which can update the maximum recorded reading at a rate of 5000 times per second when used in ‘peak’ mode. The maximum pressure reading which is displayed in the lower part of the LCD screen is updated two times per second. We would suggest a -1 to 30 bar range which is the closest range to cover the test pressures you will be generating. For the LEO1 digital pressure gauge, are the internal wetted parts all welded stainless steel 316L or is there a Viton Seal in contact with the media as well? The -1 to 3 bar sealed gauge / 4 bar absolute and the 1000 bar versions of the LEO1 have 2 o-rings, one inside of the sensor and one outside on the thread, and both are Viton. All other components are stainless steel 316L. The -1 to 30 bar sealed gauge / 31bar absolute, 300bar and 700bar versions of the LEO1 have 1 Viton o-ring on the thread and nothing internally, so these ranges have all welded parts. All other components are stainless steel 316L. We need a LEO1 Ei model pressure gauge to read from 0 to 700 bar gauge and be suitable for measuring Oxygen bottle pressure, is it possible with this device? Unfortunately the pressure range you wish to measure over is too high for a Oxygen compatible version of the LEO1. This is because the sensing element is an oil filled capsule and a fluorinated oil must be used as the fill fluid, to prevent hydrocarbons mixing with the Oxygen gas if the isolation diaphragm failed. The highest pressure rated oil available for the LEO1 is Fomblin M100 which is rated to 330 bar @60degC. Therefore a 300 bar range LEO1 Ei would be the highest possible range for Oxygen service use. Can I use the LEO1 on temperatures up to 120°C? It only takes a short length of tubing to cool the temperature significantly since there is no flow in the tube. If the gauge has to be in direct contact with 120degC, then we would suggest the DS 200P which has the option for a cooling element to protect the device from temperatures up to 300 degC if necessary, but you will need need an external DC power supply because it is not battery powered like the LEO1. What are the dimensions of the process connector on the LEO1? The standard process connector is a G1/4 male thread also known as 1/4 BSP P male. A captive seal is included which seals around the thread. The image below shows the dimensions of the 30 bar version of the LEO1. Can you also advise if they can be supplied with ½” males connections? Yes G1/2 male is possible as an adapter for small quantity purchases or as a special build with a fixed connection instead of the standard G1/4 male. The gauge process connection on the LEO1 test gauge is G¼ male. 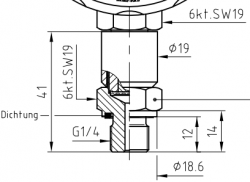 Does this gauge come with an NPT connection or is the adapter the only way? For small quantity orders an NPT adapter is the only option for a tapered thread. For larger quantity orders it is possible to offer a fixed NPT process connection. If you are frequently removing the gauge which is often the case with a test gauge it is better to use a parallel thread which relies on an elastomer seal and very little torque to create a leak tight seal. This will protect the thread form damage and ensure it is not necessary to replace or repair the test gauge just because it has a worn thread. What types of connections are available for mounting the LEO1 pressure gauge onto a tube? As standard the LEO1 is fitted with a G1/4 male (1/4 BSP P male) with a Viton pressure seal. It is possible to fit alternative fixed process connectors if the quantity required is sufficient to warrant a design modification. 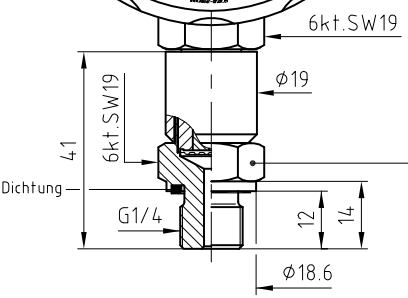 Alternatively screw-on adaptors can be supplied to convert the G1/4 male to an NPT male process connection. Is there a way to improve battery life of the LEO1? You can optimise battery life by avoiding using the “Peak” mode which consumes more power than the standard mode, and turning off the “CONT” mode ensures the gauge is not running continuously and is turned off after 15 mins from the last button press. 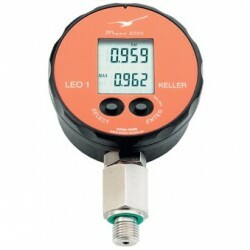 Is the LEO1 pressure indicator a stand-alone instrument which does not require any additional electronics or connections? Yes the gauge is battery powered and fully functional without the need for any additional equipment such as power supply, mounting brackets or connecting leads. Is there a way to prevent the LEO1 pressure gauge digital readout entering ‘sleep mode’ so that it displays continuously? It is a little inconvenient that the button needs to be pushed constantly in order to activate the readout display. Yes, it is the CONT on/off setting within the display menu. It is covered on page 4 of the LEO1 operating manual. Does the LEO1 include a declaration of conformity? Yas, there is a Declaration of Conformity is included as standard in the operating manual. Is the LEO1 Ei digital manometer safe to use in a zone 1 ATEX area? 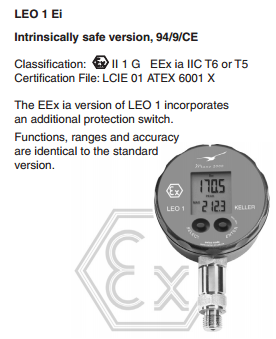 Yes, the intrinsically safe version of the LEO1 called the LEO1 Ei is ATEX approved to II 1 G EEx ia IIC T6 or T5, which is actually zone 0, so it is higher rated than zone 1. Is the calibration of the LEO1 digital pressure gauge traceable? Yes, the calibration equipment used to calibrate each pressure gauge in production is traceable to international standards and if required a traceable certificate can be provided which includes calibration data and details of the calibrator used. If required a traceable calibration certificate with 5 or 11 points can be supplied as an optional extra. I have an application that requires us to monitor water pressure available to a building over a period of one week to record the max and min pressures? If you are only interested in the highest and lowest reading over the duration of 1 week, then the LEO 1 can do this. Before starting a test, ensure the max/min peak memory has been reset via the front panel menu keys (RESET), and that auto power off is deactivated (CONT on). Also make sure the high update rate max/min store mode is off (PEAK off) so that the memory updates at a rate of 2/sec instead of 5000/sec, which would otherwise drain the battery within a 1 week period. I need a vacuum/pressure gauge able to withstand 30 bar for pressure testing and vacuum dehydration of refrigeration systems. We currently use an absolute vacuum gauge which have a bursting disc, but it will not withstand any positive pressure. We would suggest a 31 bar absolute range LEO1 which can be used in both the negative and positive pressure range. We are looking to install The LEO1 on our cooling water system, which is normally at 70degC and at 2-4bar, but we want to see whether we are getting temporary pressure peaks due to steam pockets forming under some conditions. Which version of the LEO1 would be suitable? The LEO1 upper temperature limit is 50 DegC, so you will need to mount the gauge on a stand-off pipe, which only needs to be short length, as along as the air temperature is much lower. We run a clean room environment to machine plastic billets. We have a vacuum system in place and I want to check what vacuum we are getting at the lathes on s 2″ opening for vacuum. The lowest standard range for the LEO1 will measure vacuum over -1 to 0 bar negative gauge or 0 to 1 bar absolute. I’m looking for a gauge to use on chill and hot water heating & cooling systems and would like to measure real time pressures and be able to recall the highest pressure introduced to the systems? The LEO1 will measure the highest pressure via the peak store feature. Depending on how high the temperature of the hot water system you may need to stand off the LEO1 using a short length of pipe to allow the temperrature to cool at the measurement point below the max rating for this gauge of 50°C/122°F. I’m looking for a pressure gauge with a 10 bar range to use with a hand pump for testing the burst pressure of water control system & plumbing pipe fittings. Ideally I would like to be able to read the current & burst pressure. The LEO 1 will allow you to display the current pressure value measured and the maximum reached pressure in the lower portion of the display. Please select the options you require for the LEO1 (Ei) Digital Pressure Gauge in your application and request a quote. Send us your enquiry for LEO1 (Ei) Digital Pressure Gauge to get assistance with this product type.